The seasoned leader focuses on both the task and the people. Some leaders are too task-focused. For example, Ralph led a group of seven people. With him it was all business. No small talk or reaching out to people as people. For him the only thing that mattered was results. On the other hand some leaders are too focused on pleasing people at the expense of solving problems and getting the work done. What’s your ratio? We have all met leaders who are ineffective because they don’t listen. Remember the God given ratio—two ears, one mouth. On the other side of the equation I met one leader who was a great listener but his employees didn’t know where he stood on key issues. The seasoned leader engages in the appropriate amount of both talking—stating their views and listening to ideas of others. Planning is important, but so is execution. Some leaders over plan and under execute. Of course some leaders do just the opposite. They’re busy having meetings, doing power point presentations but making no improvements in the operation. Is there a “right” balance? It depends. In some situations an hour spent planning makes the implementation go more smoothly. In a crisis situation you may have only 60 seconds to plan—quick action is required. Some leaders only focus on results. In meeting after meeting they ask, “What’s the bottom line?” Results are important but so is process—how things are done. However, putting all your attention on process is also wrong. Results count! The seasoned leader focuses on both what is being accomplished and how it’s being accomplished. An important part of a leader’s job is to coach people on how to be more effective and efficient. However, there is an important difference between too little and too much coaching. Too much can frustrate initiative. On the other hand, too little coaching and guidance can cause failure. Sometimes failure can be the best thing, life lessons often come out of failure. Other times it can be catastrophic – in the case of accident, injury, or other severe loss. Seasoned leaders know the difference between providing too much and too little coaching. Seasoned leaders know the importance of balance. But finding the right balance doesn’t mean moderation in all things. Rather it means being versatile and flexible. It means using the appropriate mix of various ingredients to help people grow and blossom. Great leaders have the wisdom to know what actions are needed and necessary to achieve success. Menkes,J. Better Under Pressure. Harvard Business Review Press, 2011. Paul B. Thornton is the author of numerous articles and 13 books on management and leadership. His latest book, Leadership - Off the Wall , highlights the guiding principles some well-known business and political leaders keep on their desks or post on their office walls. In addition to being a speaker and management/leadership trainer, he is a business professor at Springfield Technical Community College. In the last 20 years, he has trained over 10,000 people to be more effective managers and leaders. Good post. I call it managing paradox rather than balance. 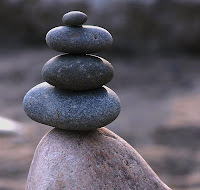 Many people confuse balance with splitting their availability into equal slices of good things. They become a mediocre executive and a mediocre mom because they try to give 50% effort to work and 50% effort to kids. I know that's not the true meaning of balance, but we manage it that way sometimes. I like paradox because paradox doesn't illustrate a balance scale of effort. With paradox, the weight isn't balanced at all. One day, you're a 100% executive because the work demands it. Another day, you're 100% mom because your kids need you completely. Good remarks. I'd add following spectra of balance: team-individual, thinking-acting, acting-reacting, building-maintaining and of course threats-opportunities. I also think that 'coaching-letting go' should be extended to 'instructing-delegating' to fully cover whole spectrum of leadership styles. Great post.I'd like to add "Success and Failure". As leaders we have to be willing to let our direct reports fail in order to achieve long-term development/success. I'm referring to "fail" in the sense of allowing them to make some mistakes that we might not make if we were doing the work ourselves because of our experience. This post is absolutely spot on. People have to remember as well that balancing doesn't mean focusing too much on one thing they've neglected in their lives. If they've given 100% to their jobs every day, keeping things balanced doesn't mean they have to overcompensate or go overboard by focusing on their family and home life at the expense of their careers. Now more than ever.... busy women need to live with practical, fresh advice to reenergize their personal and professional success. I always encourage my clients to have a solid work - life balance to increase their Sanity, Confidence & Fun - even in Nail-Biting Times. Excellent, I was just reading this and could not help but agree in just how important it is to find a balance that works for leaders, regardless of the type of industry they are working in. This post is simple, but powerful and should stimulate much thought towards various subjects in everday leadership. The responses to this post are excellent perspectives on just what balance means to different people, good stuff.